Summer is all about being outside and basking in the short months of warm weather! Whether you’re venturing out alone, with your spouse or with kids in tow, summer snacks are a MUST! They can easily be thrown in your bag, shared with a neighbor and brought to a BBQ! This summer, we’ve created the ULTIMATE list of summer snack ideas that cover just about ALL your summer needs. 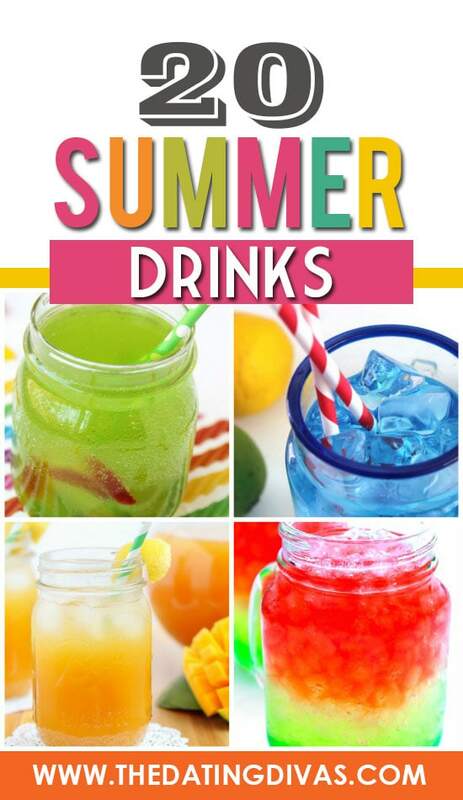 We have ideas for the kids, healthy options, decadent treats and refreshing drinks! 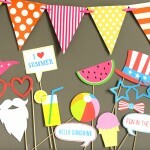 We’ve ALSO included festive ideas PERFECT for your Fourth of July plans! This summer, let the snacks be abundant and tasty! Staying healthy and feeling good is SO important over the summer! Who wants to feel sick and dragged down when you’re supposed to be out and having fun? These healthy summer snacks not only taste good but will help you FEEL good, too! And you don’t have to feel guilty about sharing them with your kiddos… healthy summer snacks are great for the whole family with these fun snack ideas! 1. Peanut Butter Apple Nachos – This summer snack is almost as good as dessert. Dress up your apple slices with peanut butter, coconut and mini chocolate chips for a protein-packed goodie. 2. Baked Apple Chips – If you love the crunch of chips, try making your very own healthy version using apples. 3. Flower Lunch – Keep it healthy and beautiful by creating a meal full of healthy ingredients like bananas and string cheese displayed in a fun flower shape! 4. Fruit Pizza – Did someone say pizza?! Fruit pizza that is! It’s almost too pretty to eat. 5. 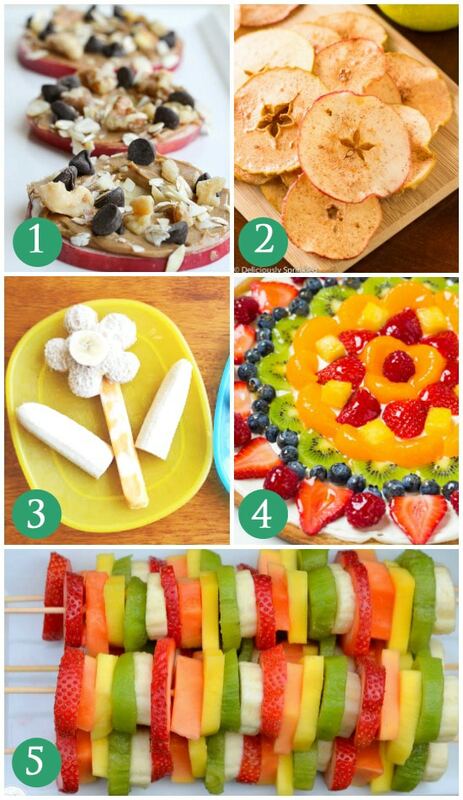 Fruit Kabobs – You can put just about anything on a stick nowadays, why not fruit?! These summer snacks are perfect for little hands, too! 6. Key Lime Cheesecake Fruit Dip – Nothing says summer like key lime! Create a key lime dip that gives you the taste of dessert without all the calories. 7. Fruit Salsa – A flavorful change of pace from the traditional tomato-based salsa. 8. Fruity Frozen Yogurt and Fruit Snacks – How cute are these summer snacks? Freeze your favorite yogurt and fruit for a refreshingly light treat! 9. Frozen Yogurt Bites – Create easy yogurt bites by simply squeezing small drops onto parchment paper and freezing them! 10. 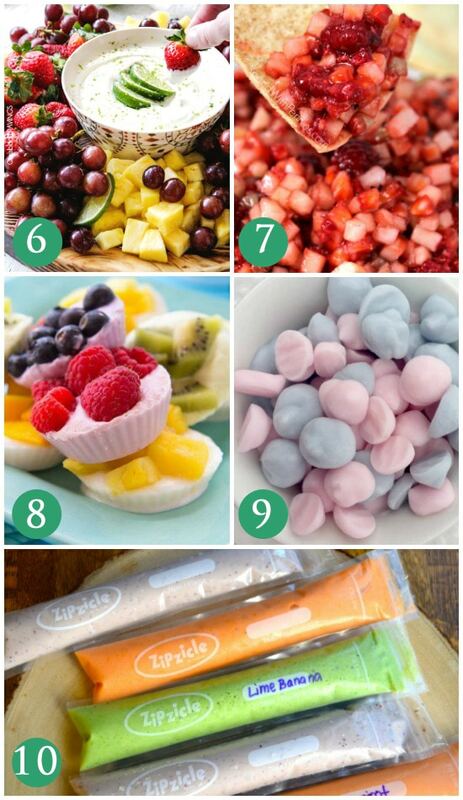 Frozen Yogurt Squeezes – Create your own healthy combination of fruit freezer pops! (You might even be able to sneak some veggies in there, too.) These Zipzicles are perfect for the job! 11. Frozen Pineapple Pops – Add slices of pineapple to sticks and freeze them for a healthy and cooling snack! 12. Watermelon Pops – Genius! Add a popsicle stick to slices of watermelon for these mess-free summer snacks. 13. Watermelon Feta Mint Skewers – It may sound like a unique combo but the flavor is refreshing and light! This is a great appetizer idea for any summer get together. 14. Sour Patch Grapes – These are as good as candy! Using a pack of jello to roll and freeze grapes, you make a healthy version of Sour Patch Kids candy. 15. Kiwi and Grape Turtles – Kids will love this healthy snack. Any time you can create pictures or characters out of healthy food you have a better chance of your kiddos eating it. 16. Cucumber Sandwiches – Skip the bread and use cucumbers to sandwich your favorite sandwich fillers. 17. Veggie Roll – Using thin strips of zucchini, roll up various fresh veggies with hummus for these tasty summer snacks. 18. Cucumber Chips – If you’re a chip eater, then these cucumber chips might be the perfect healthy substitute! 19. Strawberry Mint Salad – Again with the mint! Strawberry, cucumbers and mint make for a delicious summer salad. 20. Zucchini Pizza Bites – A healthy take on traditional pizza. Use zucchini (or even eggplant) as a pizza crust for a tiny, healthy pizza snack or appetizer. Ok enough with the healthy stuff… let’s get to the GOOD stuff! 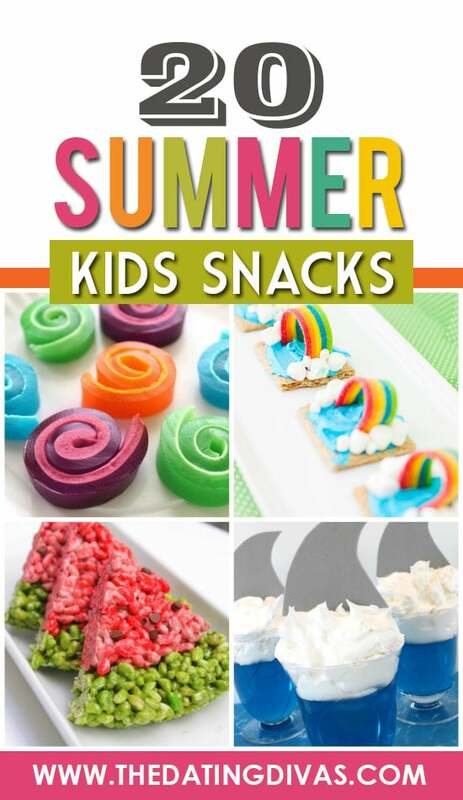 These summer snacks for kids are SURE to be a hit! So colorful, creative and the best part… YUMMY! Your kids will die over how fun these are, and they won’t be able to put them down with how yummy they are. 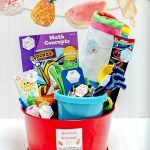 I don’t know about you, but my kids are DYING to get their hands on these fun summer snacks for kids! 21. Banana Peanut Butter Bites – Protein-packed bananas and peanut butter. Of course, a few added chocolate chips never hurt! 22. Watermelon Cupcake – This is a healthy and tasty treat. Just add sprinkles and whipped cream on top of a fresh piece of watermelon. 23. Food Necklace – This is a great idea for trips to the zoo, arboretum or nature walk! Kids can snack on the go! 24. Watermelon Rice Krispie – Just darling! What a fun summer take on the traditional Rice Krispies. 25. 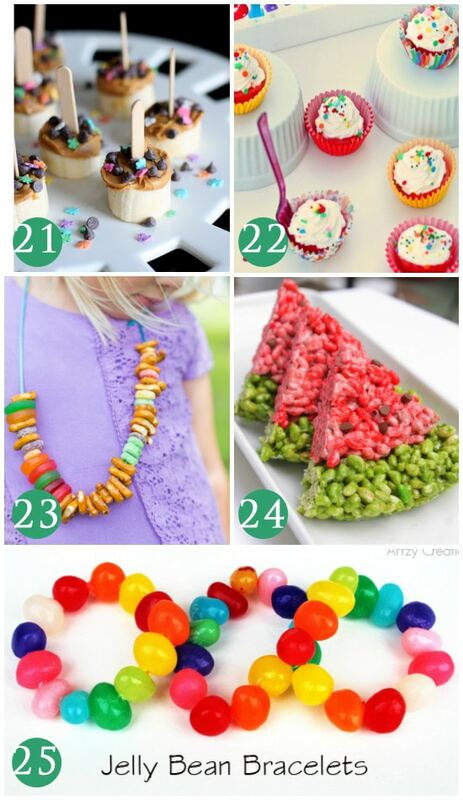 Jelly Bean Bracelets – Another fun idea for edible jewelry! Kids will love making them, too. 26. Shark Jello Cups – All kids love jello and whipped cream! And the summer has a variety of ways to use those two ingredients to make fun and festive treats, like this shark-inspired snack. 27. Underwater Jello Treats – Add gummy fish to setting jello for an underwater adventure look! 28. Jello Sky Jars – Create a scenic snack of blue jello and whipped cream! 29. Bear on Beach Jello – Too cute! Jello, whipped cream and graham crackers make up this beach-inspired snack! 30. Banana Dolphins with Jello – LOL! 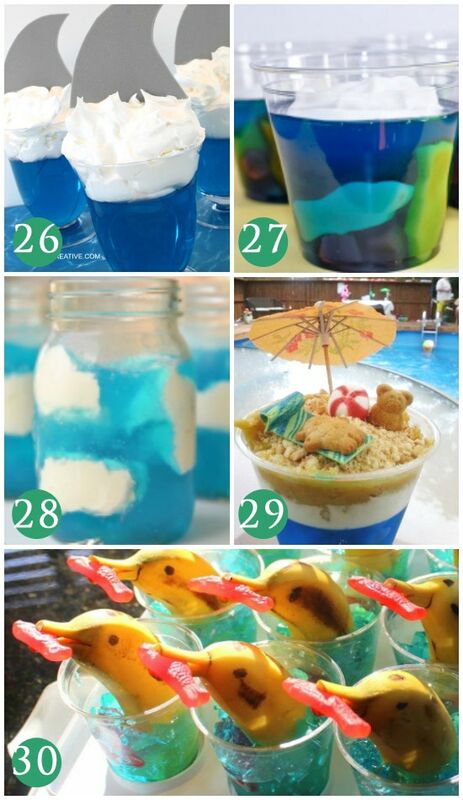 Kids will go nuts over these dolphin bananas and jello snacks. 31. Flip Flop Cookies – These SCREAM summer! Just added some icing decor to turn an ordinary cookie into a darling flip-flop for these summer snacks. 32. Graham Cracker Rainbow – These are just too cute to handle. Create a rainbow using sour airhead strips, marshmallows and blue frosting, all on top of a sweet graham cracker. 33. Pretzel Fishing Rods – This is one of the rare moments where it might be okay for your kids to play with their food! 34. 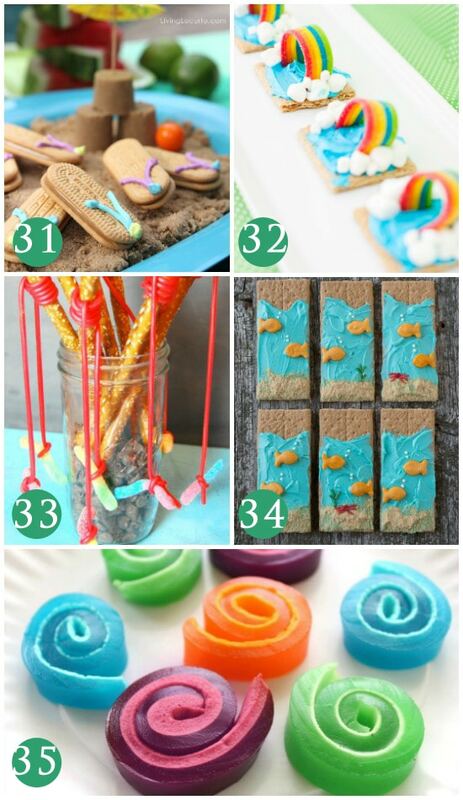 Under the Sea Graham Crackers – Create an underwater scene on a graham cracker with these summer snacks. 35. Marshmallow Pinwheels – With just three ingredients you can create a full marshmallow jello pinwheel! 36. Cheese Monsters – Silly and healthy, decorate baby cheeses into funny face monsters. 37. Dirt Cups – Dirt cups are a classic for any kiddo. Yummy chocolate pudding, cookie crumbles and gummy worms – what could be better!? 38. 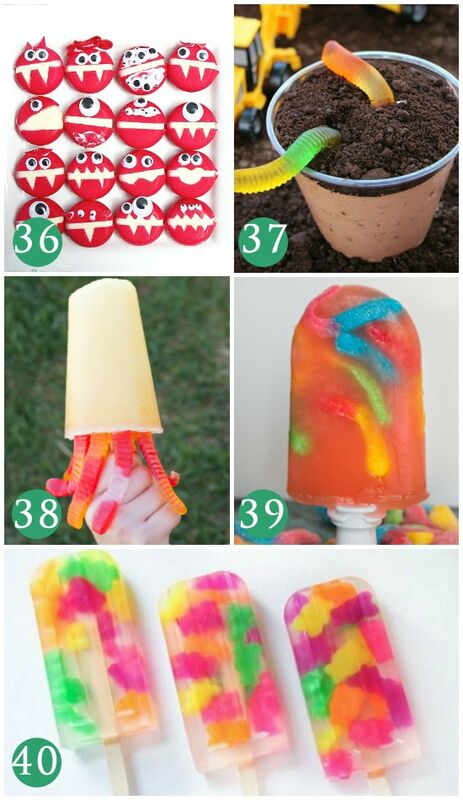 Octo Pops – So creative! When making your own popsicles, stick some gummy worms in the bottom to create an octopus look once frozen. 39. Sour Worm Popsicles – For a fun twist, freeze sour gummy worms in sweet strawberry juice for a perfect summer snack! 40. Gummy Bear Popsicle – Freeze tasty gummy bears in your favorite juice or refreshing coconut water! You’ll need some good popsicle molds, too! 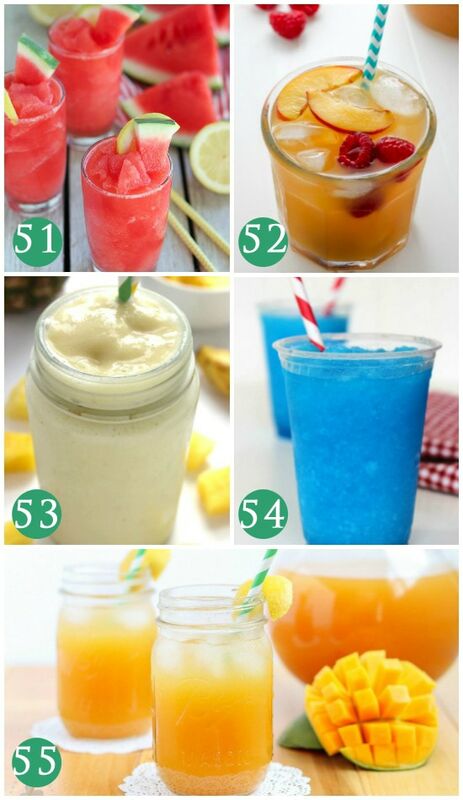 Keep cool and LOOK cook with these fun summer drink snack options! 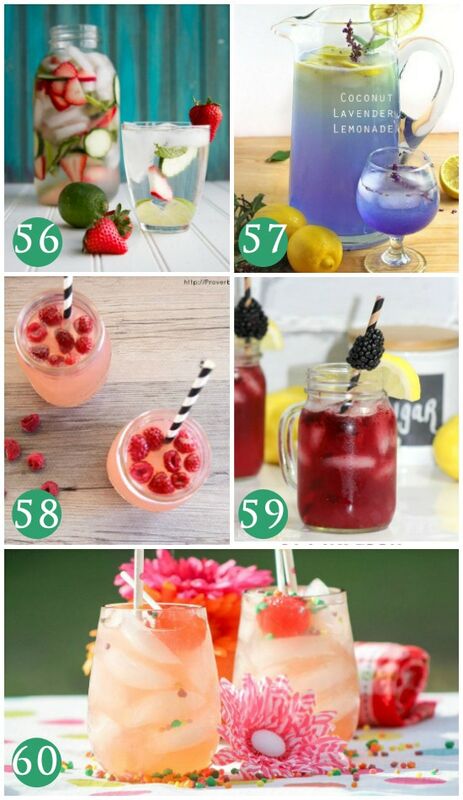 And even though they are a drink, we still think they qualify as summer snacks. 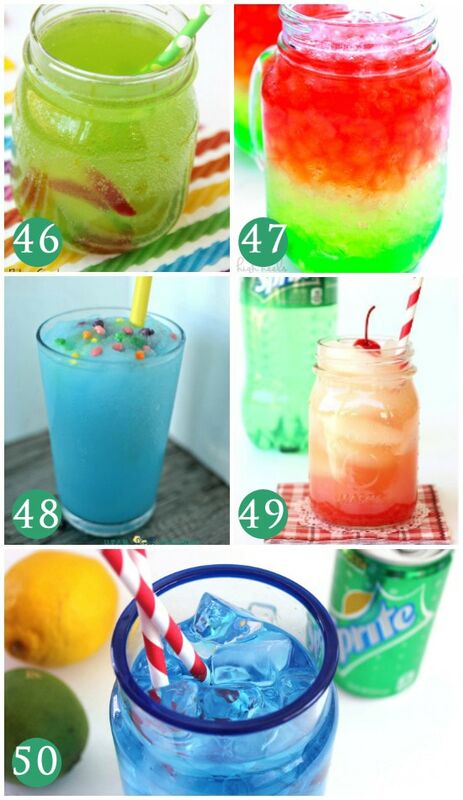 They are refreshing, delicious, colorful, and fun! What more can you ask for with your summer snacks? And the kiddos will love them, too! 41. Strawberries and Cream Milkshake – Strawberries and ice cream are a combo you can’t mess with! 42. Smore Milkshake – S’mores and summer go hand-in-hand. Why not switch it up and enjoy the decadent taste of s’mores in milkshake form? 43. Orange Creamsicle Floats – Three simple ingredients will create a refreshing summer treat! 44. 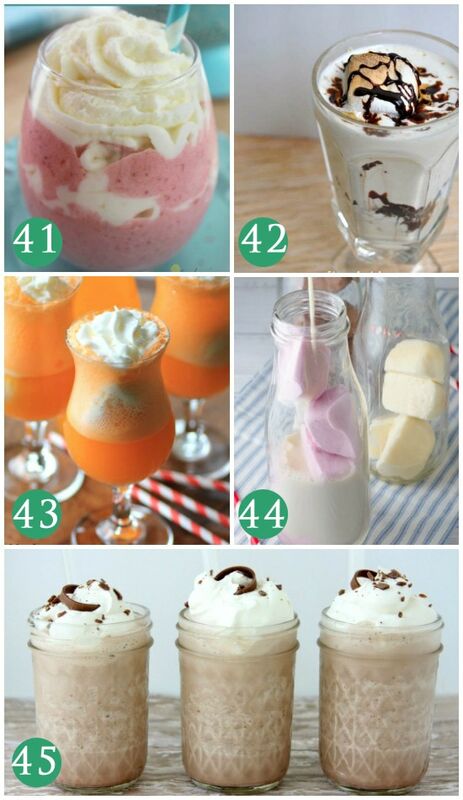 Ice Cream Cube Floats – Genius! Freeze ice cream in an ice cube tray so you can mix and match flavors with milk for a delicious shake. 45. Frozen Hot Chocolate – Hot chocolate can be enjoyed all year ’round with this frozen version. 46. Gummy Worm Punch – For picnics or parties, kiddos will LOVE this ‘gummy’ drink! 47. Watermelon Layer Drink – Great for a BBQ or kids party, this layered drink is beautiful. 48. Slushie with Nerds – Make a splash with a blue raspberry slushie! Sprinkle some Nerds candy on top for added fun and zing! 49. Shirley Temple – Who doesn’t love a classic Shirley Temple?! This is a sure crowd-pleaser. 50. Ocean Water – This just looks refreshing. With a little coconut flavoring as part of the ingredients it will definitely taste like summer! 51. Watermelon Slushie – Simply add frozen watermelon to lemonade and ice for a juicy drink! 52. Raspberry Peach Iced Tea – Ah, flavored iced tea is just delicious! Make it peach AND raspberry for something sweet to sip on. 53. Caribbean Smoothie – Pineapple, bananas, coconut milk and ice have you drinking the “beach” from your glass! 54. Raspberry Lemonade Slurpie – Kiddos will love this bright and tasty, raspberry lemonade slushie! 55. Mango Green Tea Lemonade – This refreshing drink might take a little extra handiwork but if you love tea or mango, then this is for you! 56. Strawberry Lime Mint Water – This unique combination is perfect for a bridal or baby shower! 57. Coconut Lavender Lemonade – Lavender, you say?! Just another unique twist for a relaxing drink! 58. Sparkling Raspberry Lemonade – Add Sprite to your lemonade to give it a spritzer feel that tickles your nose! 59. Blackberry Lemonade – Step back from the standard lemonade by adding ripe blackberries! 60. Tropical Strawberry Lemonade for Kids – Another delicious drink with a touch of Nerds candy. 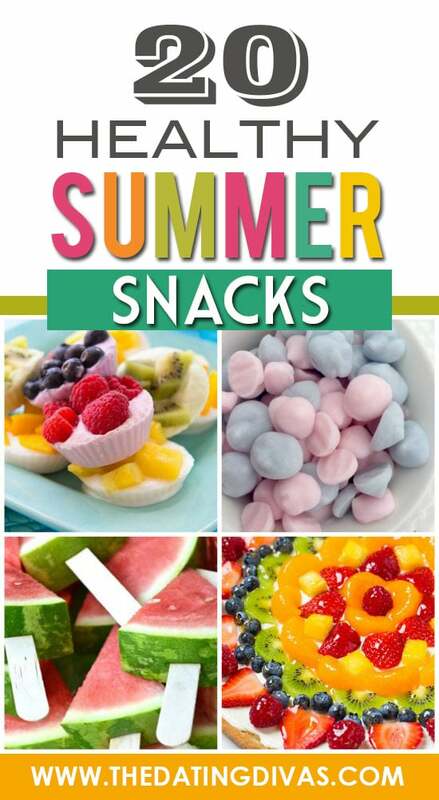 We’ve got even MORE snack options for you with these delicious summer snacks of a SWEET variety! 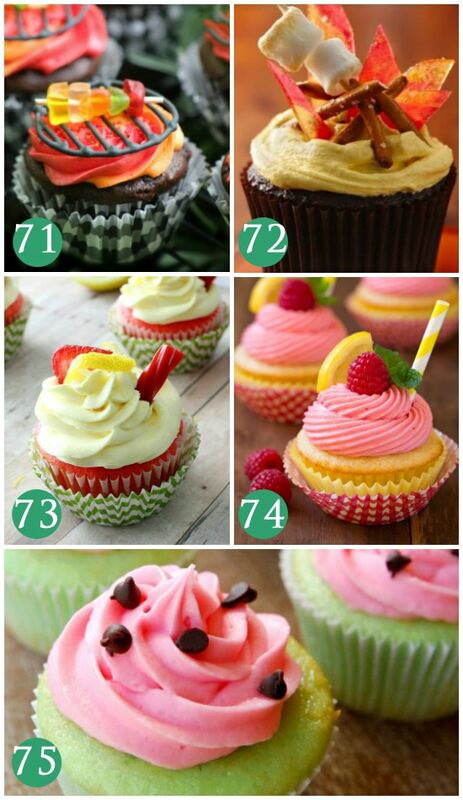 We’ve even got some really great summer cupcake ideas that’ll knock your socks off! 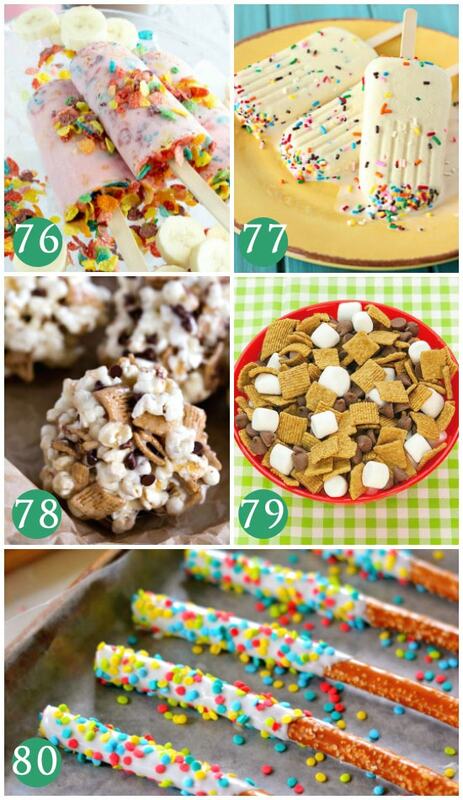 Time to bust out the sprinkles and up your summer snacks game with these delicious sweets. 61. Banana Split Stick – Dip a piece of strawberry, banana and pineapple into chocolate for a healthy banana split style treat. 62. Grilled Banana Smores – These grilled treats will melt in your mouth. Stuff bananas with marshmallows and chocolate chips and grill for an ooey-gooey treat! 63. Oreo Pudding Pops – Oreos and pudding, need we say more!? 64. 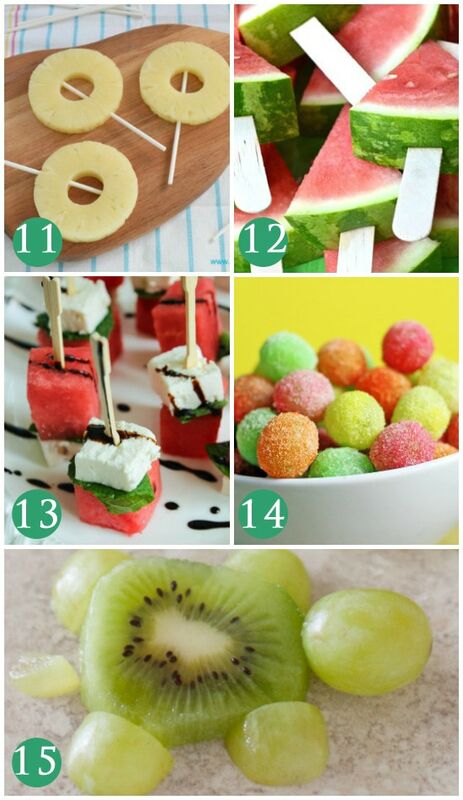 Kiwi Pops – This is a great, healthy treat that you can make at home for summer snacking! 65. 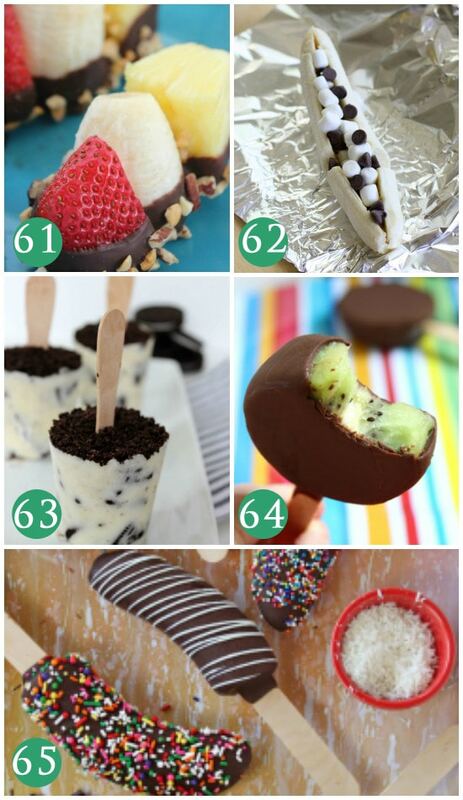 Chocolate Dipped Frozen Bananas – Kids will go bananas for these chocolate covered treats! 66. Choco Taco – Make and freeze your very own chocolate taco treats! Always a childhood favorite. 67. Dessert Pizza – Make your own dessert pizza, where you choose the toppings! 68. Crab Cupcakes – These darling crab cupcakes are so eye-catching and great for a backyard BBQ. 69. 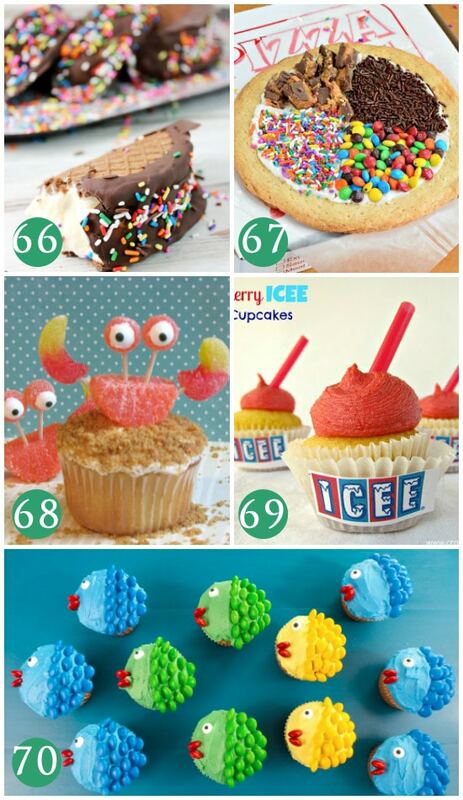 Icee Cupcakes – A sure hit for the kiddos at any summer get together with these summer snacks! 70. Fishy Cupcakes – These darling cupcakes are perfect for a pool party! 71. Grill Cupcakes – How intricate are these?! If you’re hosting a BBQ these are a cupcake MUST! 72. S’mores Cupcake – Summer just screams “S’MORE.” And we’re pretty sure these cupcakes will satisfy the s’more sweet tooth. 73. Strawberry Lemonade Cupcakes – If a fruity treat is more your style, try a refreshing strawberry lemonade cupcake. 74. Raspberry Lemonade Cupcakes – Another lemonade style cupcake, only this time… raspberry! 75. Watermelon Cupcakes – Kids fingers will find these cute watermelon inspired cupcakes. 76. Breakfast Cereal Pops – Cereal isn’t just for breakfast. Freeze your favorite flavor yogurt with your favorite fruity cereal for a unique and crunchy treat. 77. Cake Batter Popsicles – Cake batter is the BEST, enough said! 78. S’more Popcorn Ball – These might leave your fingers sticky, but they are totally worth it. 79. S’mores Snack Mix – This is a throw together snack, perfect for neighborhood get togethers. 80. Rainbow Pretzel Sticks – This is an easy treat where you can get the kids involved in making! 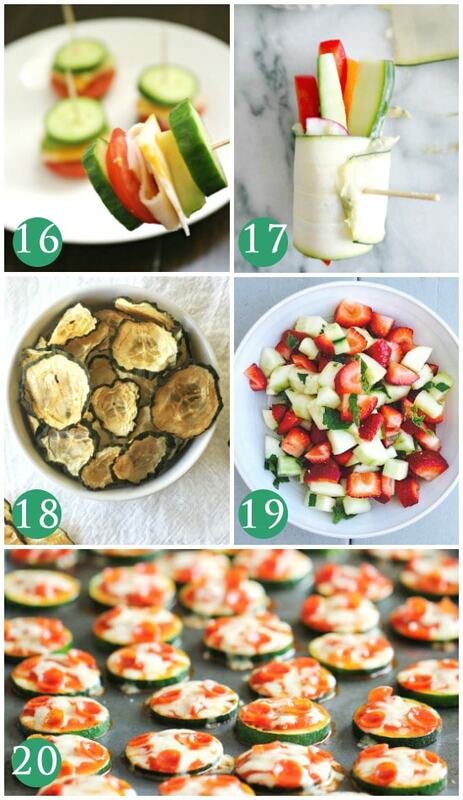 We are LOVING all of these cool summer snack recipes! 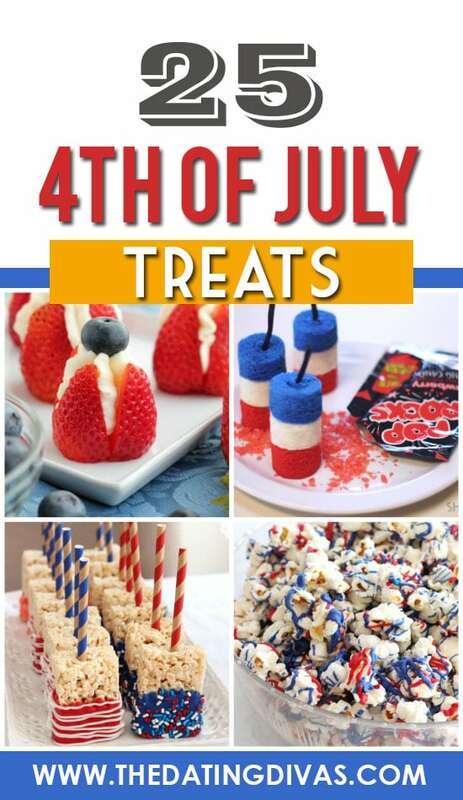 Summer snacks never looked better with these 4th of July recipes for all of your 4th of July parties this summer. When it comes to cute summer treats, these take the cake. 81. 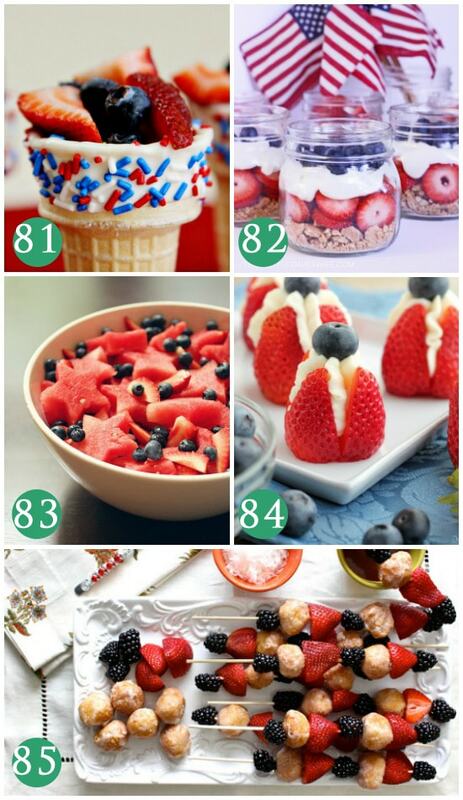 Patriotic Cones – Spice up the rim of a standard cone and fill it with sweet fruit for these summer snacks. 82. Patriotic Parfait – Layer granola, yogurt, blueberries and strawberries to create a patriotic-inspired parfait. 83. Cookie Cutter Fruit Salad – Grab the kids and your cookie cutters to make this simple and patriotic fruit salad. 84. Cheesecake Stuffed Strawberries – This recipe gives a simple cheesecake filling perfect for squeezing inside a ripe strawberry! 85. Donut Hole Skewers – Yummy! String doughnut holes along with fruit on a skewer for a sweet treat with these summer snacks. 86. Patriotic Dirt – Every kid LOVES dirt! 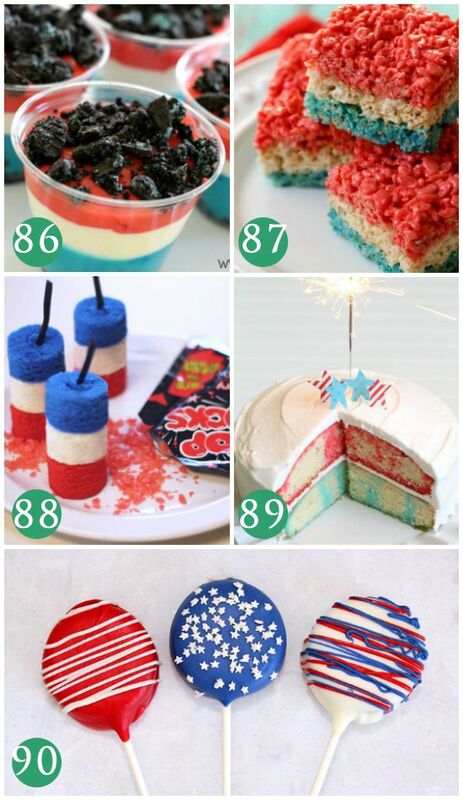 Give it the patriotic feel with a little food coloring! 87. 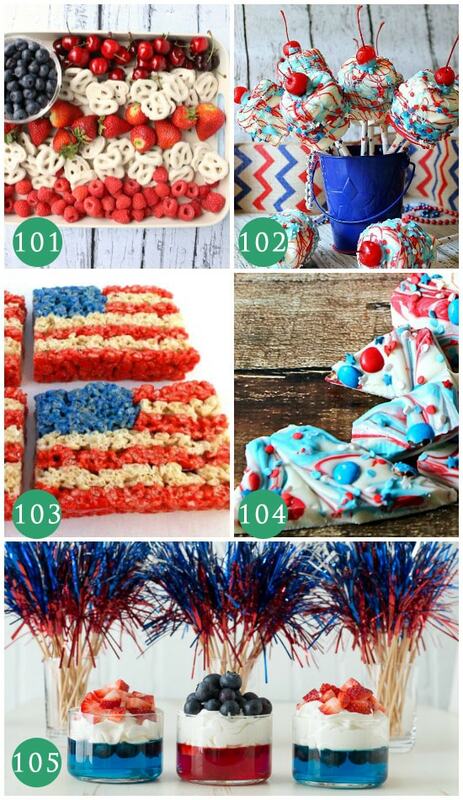 Patriotic Rice Krispies – Easy and always a crowd pleaser, patriotic colored Rice Krispies. 88. Firecracker Cakelettes – These summer snacks might take a little more time but they are totally worth it due to their cuteness! 89. Patriotic Poke Cake – A beautiful cake designed for a festive Fourth of July get together. 90. Patriotic Oreo Pops – Create Oreo pops by using dyed chocolate! 91. Firecracker Dogs – These summer snacks are so clever! Wrap a hot dog in a crescent roll, add a cheese star on top and VOILA, you have a darling firecracker dinner for kids! 92. Dipped Flag Pretzels – The kids will love making these salty treats with you! 93. 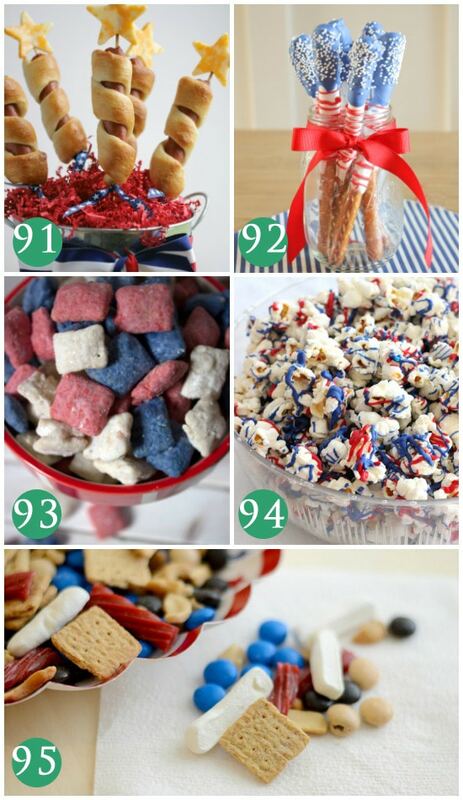 Patriotic Puppy Chow – Who doesn’t love puppy chow?! Just add some coloring to give it the holiday spirit. 94. Patriotic Popcorn – Oh.Em.Gee! Chocolate covered popcorn is always a hit! 95. 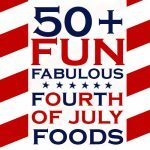 Patriotic Trail Mix – Sweet, savory AND fruity!? Now that’s the kind of trail mix I’d like to eat! 96. Flag Pretzel Bites – Again, grab the kiddos and have helping hands to make these darling flag treats. 97. Patriotic Lollipop Centerpiece – This is super easy and a perfect centerpiece for any Fourth of July party. Love the galvanized bucket too! 98. Patriotic Dipped Pretzels – Just another take on a festively dipped pretzel! Simple, but always a crowd pleaser. 99. Patriotic Dipped Rice Krispies – Anything on a stick is genius! It makes is SO much easier for eating and just gives it such a cute look! 100. Red, White and Blue Layered Jello – This may take a little patience but the outcome is gorgeous! 101. Flag Fruit Plate – It doesn’t always have to be about what you make, it can be about how you display what you have that gives it the holiday feel! 102. 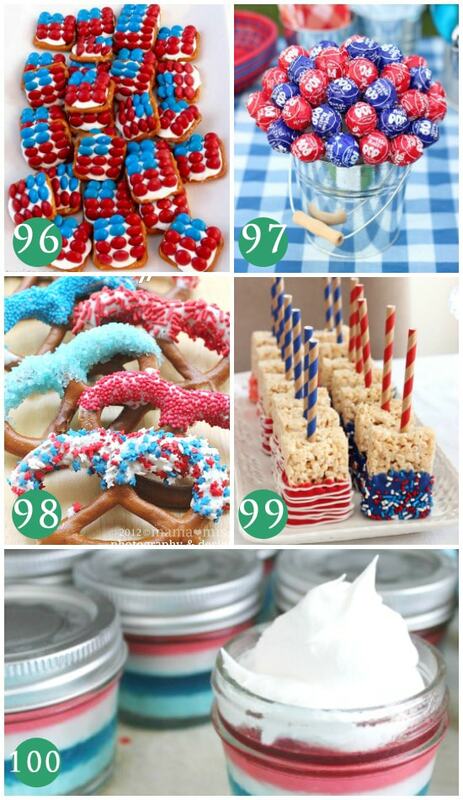 Patriotic Marshmallow Pops – Did someone say marshmallow on a stick?! 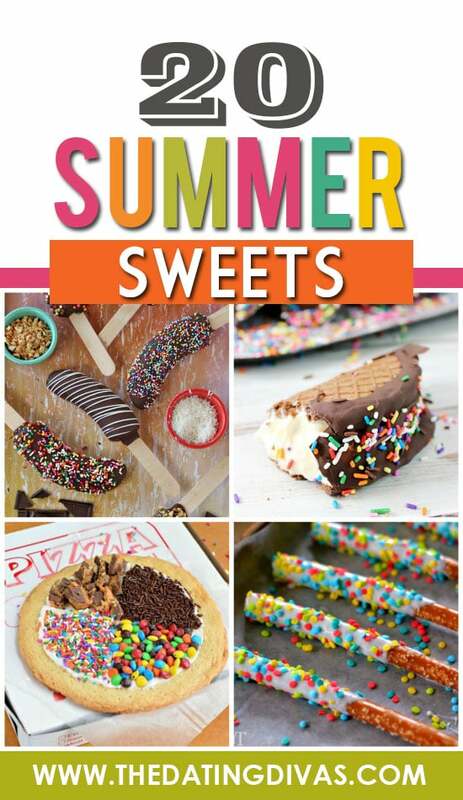 Dip marshmallows in a little chocolate and sprinkles for these sticky and delicious summer snacks! 103. Flag Rice Krispies – This may take a little handy work but the outcome is perfect for celebrating the holiday! 104. Fourth of July Bark – YUMMY! White chocolate bark with festive goodies inside might be gone before you even get to try it yourself. 105. Festive Jello Cups – Beautiful! These jello, fruit and whipped cream layered masterpieces are gorgeous and delicious. Is your mouth watering yet?! There are so many healthy AND tasty summer snacks on this list, it’s hard to decide where to begin! But if you’re looking to stay healthy or get healthy this summer, use our healthy summer snack options and check out our 101 Summer Slimdown Hacks that will have you looking AND feeling great all summer long! 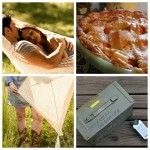 For our foodies, we also have an amazing collection of 100 Simple Summer Suppers you can sink your teeth into as well! 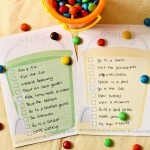 And last, if you plan on hosting a get-together, check out our 65 Outdoor Party Games (adults to kids) that will have all of your guests entertained!